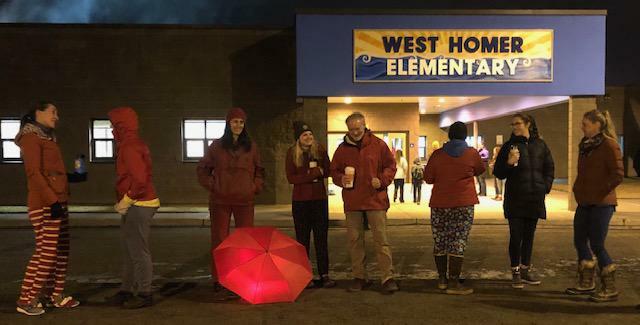 KPBSD staff wear red outside of West Homer Elementary School to symbolize their frustration with contract negotiations. Contract negotiations between the Kenai Peninsula Borough School District and its employees are reaching a boiling point. The end of this month will mark one year since contract negotiations began and staff are demonstrating out of frustration. Later this month, negotiations will move into arbitration, but middle ground may be hard to find. Janet Bowen is one of over a dozen district employees standing outside of West Homer Elementary School early Wednesday morning. Some are teachers and others are various staff, but they’re all wearing red to symbolize their frustration with contract negotiations between their respective unions and the district. Bowen is a secretary for Fireweed Academy, and she said the fact that staff are still operating under last year’s contract makes her feel undervalued. “It's an old contract that for me says, ‘well, you're not really worth my time and effort to bring it up to date,’” she said. Unions representing both teachers and staff in the district first sat down to work out a deal with the school district roughly a year ago. Despite several attempts to come to an agreement, both negotiations have stalled. Bowen wants the next contract to include a cost-of-living adjustment. “I feel like I put everything into this job, and I love my job and I want to be able to work with the comfort of knowing I have a contract that gives me a fair wage and gives me raises that work with inflation, with what's going on in our community and also that gives me a fair and equitable health insurance,” she said. Beth Schott is a special education teacher at West Homer Elementary and she agrees that healthcare is one of the biggest disagreements between staff and district administrators. She said healthcare premiums are too expensive, and she said that’s placing an unfair burden on district employees that make less money. “We have teachers, we have paraprofessionals, we have custodial staff and just lots of people across our district at different pay grades but all under the same benefits,” she said. “So that just gets a little bit tricky when premiums are raising and money is getting tight everywhere. David Brighton, president of the Kenai Peninsula Education Association, the union representing teachers in the district said they’ve seen employee premium cost essentially doubled in three years. “In fact, most employees are earning less net pay this year than they were last year because of the increased cost of healthcare,” he said. The union wants the district to remove a cap that reduces the district’s share of healthcare premiums once it’s reached. The length of any new contract between teachers and the district and raises to keep up with the cost of living have also been sticking points. In October, the district offered a $500 cash stipend to teachers, but Brighton said the union wants a .5 of a percent pay-bump this year. He said that would increase to 1 percent next school year and 2 percent the following year. The union acknowledges the state is in a recession, but it believes the current offer is a competitive one. Pegge Erkeneff is the spokesperson for the district. She said both of the unions’ proposals are too expensive. She said the fiscal reality for the district is uncertain. Gov. Mike Dunleavy recently proposed cutting $20 million dollars from public education. That money was already allocated to school districts across the state and the Kenai Peninsula Borough School District planned to use its portion to pay for 11 and a half teaching positions. However, Brighton with the teacher’s union argues despite the state’s fiscal woes, staff in other school districts in Alaska have received better deals. Erkeneff notes that teachers are still receiving raises based upon their pay schedule. Still Brighton warns that teachers may leave the district if an agreement isn’t reached. The process is moving into non-binding arbitration, which means if the latest round of negotiations don’t bear fruit, both sides will be back to square one. In the meantime, Brighton said teachers and district staff will continue wearing their red shirts. The Alaska Department of Education and Early Development is assessing schools in a new way. The department rolled out it’s new accountability system in late October, which they call the System for School Success. The System for School Success has two parts. The first part gives the school an overall value, based on data such as test scores, student growth and chronic absenteeism.